A camera man gets up, close, and personal with the human and machine actors on the “Sparked” set. If you thought “SPARKED” – the new short film by Cirque du Soleil, ETH Zurich, and Verity Studios – is too real-looking to be CGI, you were right. But why go to all the trouble of using quadrotors to get those lampshades dancing in the air for real? We asked Bill Keays, Science and Technology Advisor at Cirque du Soleil, to give us an insider’s perspective about Cirque’s motivation for the film and how it came together. Bill Keays on the SPARKED film set. [Robohub] What was the inspiration for the film? [Keays] The combination of autonomous flying machines with Cirque du Soleil magic was so evidently bursting with potential we committed ourselves to make something original together not knowing what it would be at first. An iterative creative process ensued involving all participants, and what emerged was a wonderful script that carried the talent from both sides of the formula to a whole new level. Who are the main partners on the project? It was a highly democratic and highly collaborative process. 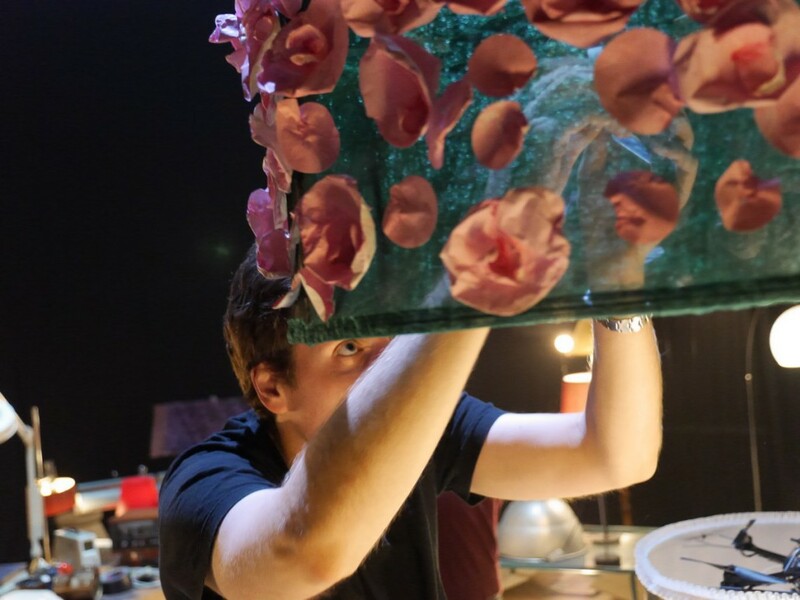 Raffaello D’Andrea of ETH Zurich and Verity Studios, and Welby Altidor of Cirque du Soleil were the project leaders, but the true collaborative nature of this project is reflected in the fact that no participant roles are specified in the credits. The very first discussions were held between Prof. Raffaello D’Andrea at ETH Zurich and myself as Science and Technology Advisor at Cirque du Soleil in March 2012. After ongoing discussions and considering various options, the two organizations eventually committed to a creation project in January 2014. The “Sparked” film set. 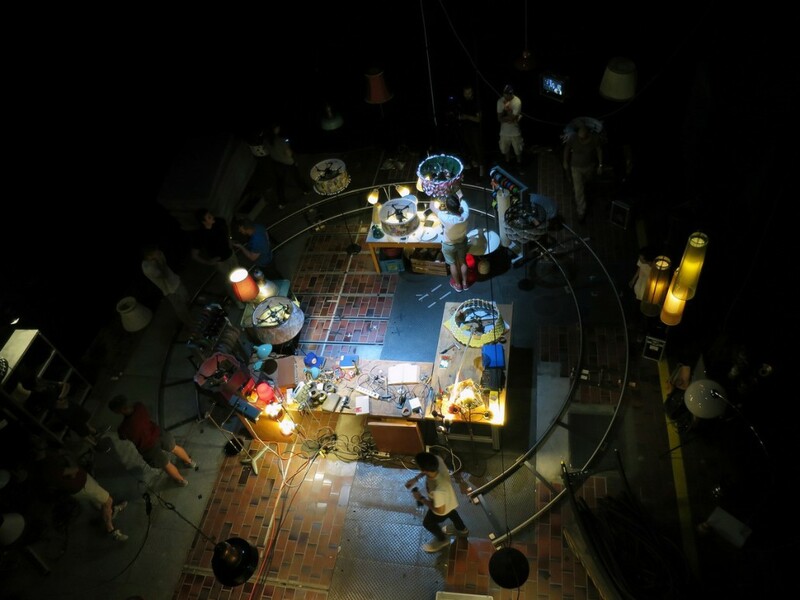 The shoot took place in the Flying Machine Arena at ETH Zurich, a portable space devoted to autonomous flight. For Cirque the project demonstrates a whole new avenue for channeling creativity. It allows Cirque to reach a new audience externally and provides inspiration internally to push the creative envelope in new directions. As such is a highly effective, multifaceted communications vehicle, and it will certainly be submitted for competition. What were the production costs? The large bulk of the cost came in terms of human resources split between three organizations. The exact figures cannot be known. How long did the project take from first concept to finished film? What were the major steps/milestones? The whole project, from go-ahead to YouTube release, took under 8 months. It was a back and forth process whereby content was driven by discussions between Cirque, Verity, and the film director. Through this method we progressed through initial concept design, script development, set and prop design, and finally the shoot, with intense hardware and software development taking place throughout. The product was then handed off to post production and then to distribution. Setting up before a flight scene. Who designed the lampshades? The photos show researchers from ETH and Verity fitting the quads with them. Did you provide dimensions to props experts and iterate? How did that process work? It was indeed an iterative process. 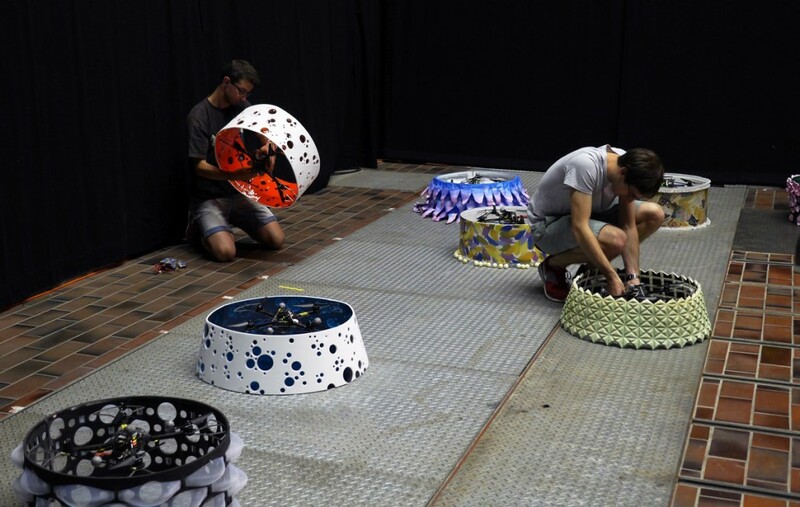 The lampshades were designed and produced by the creative team at Cirque in Montreal who used their own quadrocopters for flight tests to ensure that they would be compatible with the flight environment at ETH Zurich. Guidance from the ETH and Verity teams was indispensable of course. The Flying Machine Arena fully possesses the ability to control the flying machines with a Kinect or other similar devices, or even hand gestures. But given that this is a movie production, the movements of the actor and the flying machines were choreographed as is the convention in film practice. Was there any CGI at all in the film? How much is real? None whatsoever, it’s all real; and even though it looks terrific in the movie, this pales in comparison to seeing it in the round. It was mindboggling to watch live. Has Cirque worked with robots before? Yes, Cirque has experimented with robots in the past, but never flying ones. 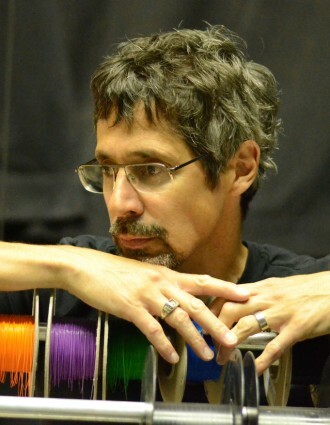 What were the biggest challenges of putting live actors together with the quads on stage? Given that this is such an unusual circumstance for making a movie, we didn’t know how our lead actor would react to the flight environment. But the high precision of the flying machines and terrific expertise of ETH Zurich’s Flying Machine Arena staff quickly inspired confidence. By the second day, remarkably, our actors, both human and mechanical, were moving about the set with terrific ease, paying little attention to each other. Was safety ever an issue? The design of the lampshades was convenient in that it shielded the blades of the quadrocopters, thus making them far less likely to strike anyone or anything. There were a couple of crashes and a few low passes, but at no point was there any real apparent danger. 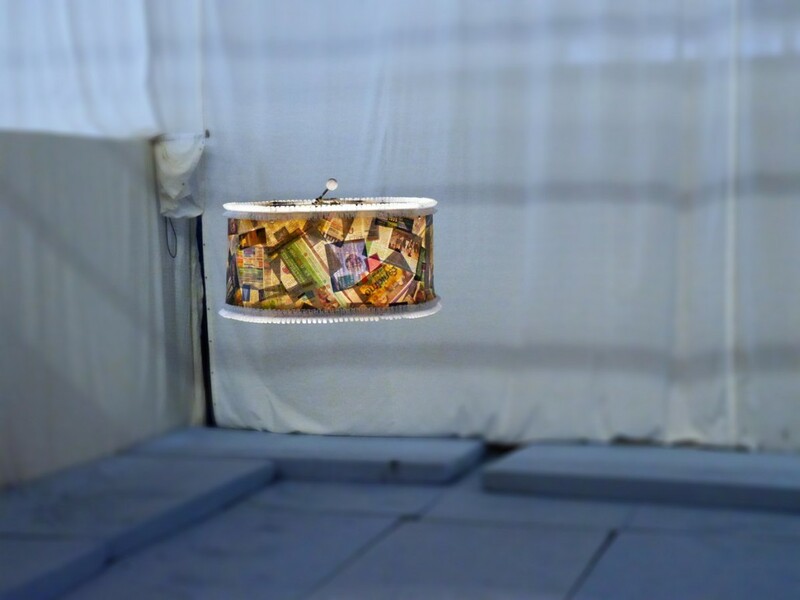 Believe it or not, all the scenes with the flying lampshades are completely lit by the lampshades themselves! Another fortuitous design feature. Were there any other challenges? The rapid power consumption of the flying machines meant that battery changes would be frequent. With time, the switch-overs began looking like Formula 1 pit stops, performed with great speed and precision. What was it like for the researchers from the lab to have to ‘perform’ for the camera? How long did they have to rehearse before you were ready? The lampshades arrived in the weeks prior to the shoot so there was time for Verity Studios and ETH Zurich to fully test their aerodynamic abilities, and to run through the choreography. In the days preceding the shoot we performed flight tests according to the story board and had one practice day with the lead actor. However, due to the extreme time constraints imposed by the film crew, the control software had to be designed such that flight plans could be altered at a moment’s notice to meet specific requests from the director. This proved to be an invaluable tool and was instrumental in completing the shoot in the allotted time. Had your previous work (e.g. demos, presentations) prepared you for working with quadrotors on a film set? Absolutely, the Flying Machine Arena team had performed extensively with flying machines in public spaces and conferences (including TED), so much of this experience transferred well onto the movie set. An early flight test in the Flying Machine Arena. The quadrotors peek through in the film at times, as do the retro reflective markers for the motion capture system – was this intentional? It is true that the quadrotors are sometimes visible, but the visual quality of the movie is so overwhelming that it is difficult to remain focused on technical bits. We actually liked the fact that they were occasionally visible; as sort of a wink to those of us who are knowledgeable about them. 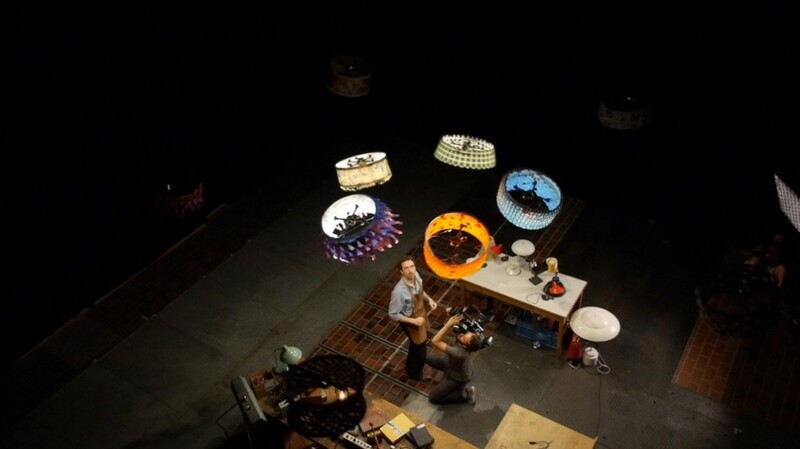 With previous demos, the quadrotors played a leading role – but in this film, they are literally hidden behind lampshades. How does it feel to see them step back into a supportive role for this film? But the flying machines are not hidden. They are in dress like all actors in this movie; they have character, motivation and certainly no lack of presence. As the devil’s advocate, I would be inclined to challenge the assumption that they are playing a supporting role. Why not just do it with CGI? First of all, because the Flying Machine Arena is not about CGI. It’s about control systems, aerodynamics, and sophisticated algorithms that yield a physical manifestation of uncommon beauty. The second reason is because you can’t do CGI in front of a live audience and Cirque du Soleil is in the business of live entertainment. Even though this extraordinary little movie is a gem in its own right, it is primarily the proof of concept for something far more powerful; something that must be seen live. All images credited to the “Sparked” team. For more insight on the film see also New quadrocopter video points to a future for flying machines in entertainment by Markus Waibel of Verity Studios.